A unique and exciting paranormal romance, The Night Everything Fell Apart brings angels and demons to life, all while blurring the line between good and evil. Arthur Camulus has just woken, battered and disoriented, from his Ordeal, a dangerous rite of passage for Nephilim, or demons descended from fallen angels. Arthur has little control over his new demon powers, but he must adapt quickly because more than one potent entity seeks his power and will destroy him for it. Arthur has few allies, Cybele, a female Nephil and his true love, is by his side. In this exciting tale, Arthur and Cybele battle impossible odds against dangerous rival Nephilim and face the archangels on a quest to retrieve the powerful staff of Merlin, the one item that could save them. Author Joy Nash deftly handles a plot with multiple settings, timelines, and important characters without ever losing the story’s forward trajectory. She juggles a multitude of creatures and beings — including Nephilim, angels, archangels, cherubs, and demons— without creating confusion. Furthermore, her characters are wonderfully layered and appealing. With the exception of the hellfiends, evil entities who threaten all of humanity, all of the creatures have relatable human qualities. For example, while supposedly evil, the Nephilim feel friendship, loyalty, and love. On the other hand, the archangel Michael is surprisingly and satisfyingly flawed. Unlikely pals Maweth and Fortunato provide a touch of humor. And the romance and chemistry between Arthur and Cybele is strong and compelling, effectively driving the story. The novel also delivers action-packed, epic fight scenes, and the folklore of Merlin and King Arthur is woven cleverly into the fabric of the story. 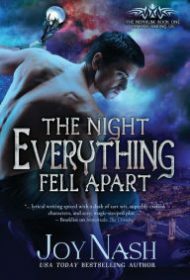 Packed with thrilling action and heady romance, The Night Everything Fell Apart is a fantastic read for fans of paranormal romance. A strong series debut, the book resolves its primary conflict while opening the door for further stories to come.